BEN TAUBER: This year marks the 100 year anniversary of World War I, a crucial moment in world history responsible for cementing much of the current global order. And yet, specters of the “war to end all wars” loom large today. Much of the progress made in the last 100 years shows signs of deterioration. Far-right governments and anti-European Union sentiment continue to crop up around the continent. From Britain, to Italy, to Hungary, to Germany and Sweden, rightist and EU-rejectionist sympathies seem to be taking a growing hold on Europe, leaving concerning implications for a continent whose history is plagued with nationalist violence. Despite President Trump’s assurances, nationalism is a term with a violent past, one anathema to the current order of global cooperation formed out of the ashes of the Second World War. And the fact that we as a public are not immediately alarmed is evidence of an dangerous but inevitable desensitization to that term. Speaking at an Armistice Day ceremony in Paris, French President Emmanuel Macron railed against this rising ideology, calling for a defense of liberal values and calling nationalism “a betrayal of patriotism.” Macron defended the European Union and the United Nations, praising the “spirit of cooperation” that has kept overall global peace for over seventy years. It is difficult to see this speech as anything but a denunciation of Trumpism and European far-rightism, a stark defense of the current global order, and a plea to maintain that which has kept the peace, to not let reactionary politics drive policy. That plea may fall on deaf ears. Angela Merkel, Chancellor of Germany and defender of the European order since 2005, has announced that she will be stepping down in in 2021 to an uncertain future in German politics, leaving Macron alone to battle the rising tide of the right. It is a scary proposition, and one that can get scarier as the refugee crisis continues and Russian destabilization efforts loom large. In China, Xi Jinping exerts a growing dominance. In the Middle East, the Syrian crisis continues and the Iran nuclear deal hobbles in the wake of a US pullout. In a post-Trump United States, the next leader must be someone willing to fight with, not against, Macron to preserve what has gotten us this far and is now threatening to collapse before our very eyes. 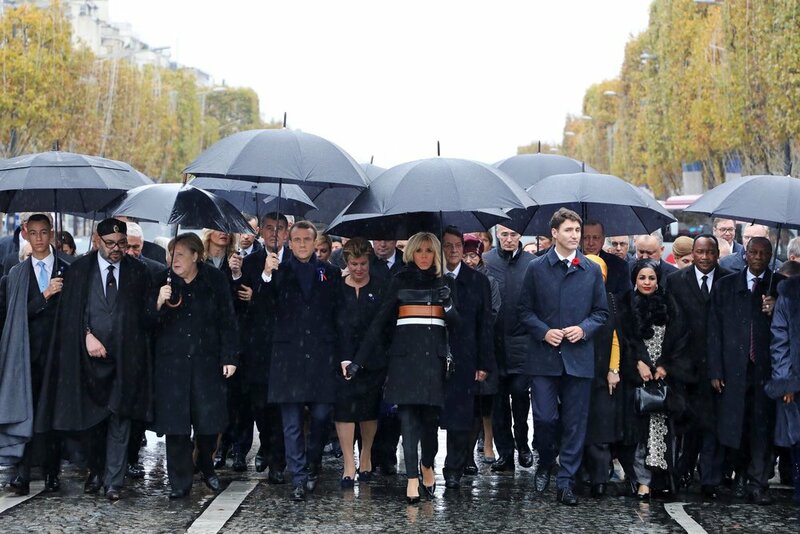 Later that day, Macron asked if the image of world leaders standing together under the Arc de Triomphe would go down in history as a testament to the everlasting international peace or “on the contrary, a photograph of a final moment of unity before the world descends into a new disorder?” If we are to learn anything from the past 100 years, it is that we must pray it is not the latter.